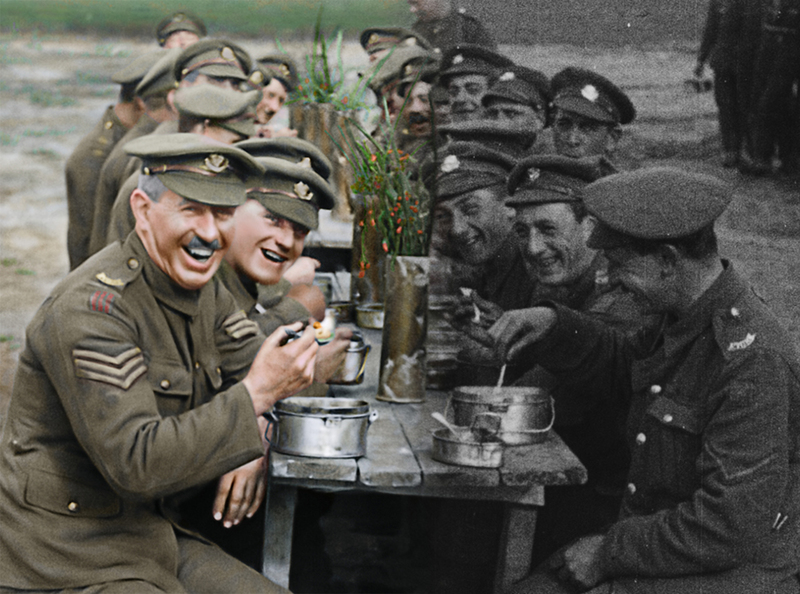 A before and after image showing the original film on the right and the restored and colorized image on the left in a moment from THEY SHALL NOT GROW OLD. Courtesy of Warner Bros. Pictures. Director Peter Jackson has taken us to fantastical worlds in THE LORD OF THE RINGS. He’s enlightened us to the profundity of death in THE LOVELY BONES. He’s shown us that people deal with grief differently in THE FRIGHTENERS. He taught us that some friendships just aren’t meant to last in HEAVENLY CREATURES. 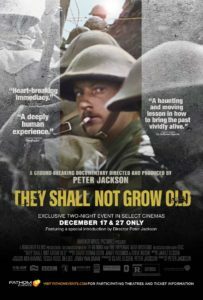 All of the above have made him the perfect storyteller – one with lots of technology readily available to him – to put his slant on The Great War, and in doing so, deliver a fully cinematic sensory experience in THEY SHALL NOT GROW OLD. This isn’t the prototypical, newsreel-style documentary assembled from war footage we’ve seen countless times before in history classes or museum installations. What we’re hearing are not interviews conducted with veterans recounting the past in fragmented thoughts and feelings. There are no time and date markers denoting when and where the story is taking place during the four years spent in the raging war. The living history told by those who experienced it first-hand, and shown through never-before-seen footage, would assuredly be engaging and poignant by itself. But Jackson uses them as a foundation to build upon in a revolutionary way, shaping these harrowing tales into a powerful new entity. By using 3D, colorization and state-of-the-art restoration, the story arc he crafts hammers home the humanity, humor and heartbreak found on the front lines. He sets up as much of a three act narrative structure as he possibly can – starting with civilians answering the call to become soldiers, through the gripping climax, to the haunting and bittersweet ending. There’s an irony in a destructive force such as war bonding these men for life (whether it’s short-lived or not), forging a fidelity through gunfire and glory. Jackson and his team of tech and sound wizards help the audience experience what World War I felt, sounded and looked like for those bright-eyed, bushy-tailed young British men. Their audio clips of interviewees in their 60’s and 70’s (meticulously culled from 600 hours of archives) vividly recount what the battlefield even tasted like. The formerly silent black and white footage is given a soundtrack – a mix of foley and ADR – to recreate the wartime sound. Color and restoration flesh out the soldiers, giving us greater insight into the dedication and fearlessness of these men. The editing also enhances the emotion. Jackson and editor Jabez Olssen juxtapose footage of the soldiers in good times, smiling and hamming it up for the cameras, with the Brits’ climactic charge into No Man’s Land, where bloody bodies litter the landscape. In taking on a groundbreaking effort such as this, Jackson and company bring humanity to these courageous heroes, who passionately fought for freedom and later recognized the futility of war. Perhaps the most memorable thing about the film is not the technology employed, but the insights gleaned – lessons that will hopefully prevent history from repeating itself again. THEY SHALL NOT GROW OLD plays for two nights, December 17 and 27, 2018 and will open on January 11, 2019 in NY, LA & Washington, DC. Tickets are now on sale through Fathom Events.